Pictured above: The complex Environmental Sample Processor, which serves as a robotic DNA lab, prior to its placement in an autonomous vehicle that will take it to sea. The fluid realm presents a three-dimensional playing field that can change dramatically at any given moment. Unlike trees dotting a terrestrial landscape, nothing drifting or actively swimming in the ocean, lakes, or rivers stays in one place for very long, giving “Where’s Waldo?” an entirely new meaning. The challenge of just being in the right spot at the right time to observe the life that comes and goes at the whim of currents, seasons, and biology, is a primary inspiration for developing platforms and sensors that can persist in the environment for extended periods of time and operate without anyone in attendance. The Environmental Sample Processor—a device that allows scientists to automatically measure genetic material in the water—has contributed to major advances in our understanding of ocean processes. The ESP is also being used in places like Yellowstone National Park to detect human health hazards in rivers. Persistence is particularly important when research scientists and resource managers need to repeatedly acquire water samples from remote places to determine the presence of various species. Those samples must be filtered to collect microbes or tiny bits of material shed by larger animals, and then that concentrated sample must either be preserved for later genetic analyses in a laboratory or made available for immediate onsite biological testing. Three ESPs are prepared as part of the MiVEGAS fleet to be deployed in the open waters of the Pacific. Photo by Elisha M Wood-Charlson. MBARI’s homegrown Environmental Sample Processor (ESP) is a robotic water sampler designed specifically for collecting and analyzing such samples to provide that persistent presence without necessarily requiring someone to be there in person. Historically the ESP has been used for detecting particular microbes, but recently it was also proven useful for collecting bits of DNA shed from larger animals in both ocean and freshwater settings. This capability opened the door in 2018 to a number of field studies ranging from the open waters of the tropical Pacific, coastal waters of Monterey Bay, and coastal streams in Central California, to Lake Erie, the Yellowstone River, and the National Elk Reserve. A complex web of tiny organisms govern the abundance of life in the ocean. Some harvest energy from the sun through photosynthesis while others consume the organic matter the photosynthesizers produce. If we want to understand how organisms flourish and pass along the energy from the sun, moving vast quantities of elements between the atmosphere and ocean and, ultimately, to the deep sea, we have to make observations at multiple places simultaneously to quantify what takes place over long periods of time and over vast areas. We also need to follow organisms as they move with ocean currents over the course of many days to reveal how their underlying genetic capacity comes into play to facilitate these processes. 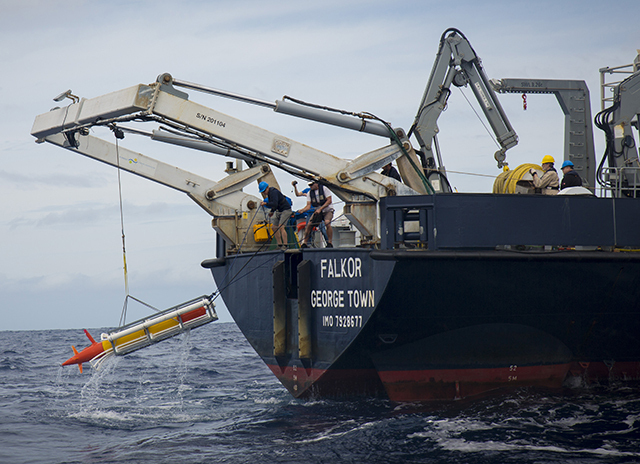 A long-range autonomous underwater vehicle carrying an ESP is recovered to the R/V Falkor after a mission. Photo by Thom Hoffman / photo courtesy of Schmidt Ocean Institute. With those considerations in mind, MBARI’s ESP team, led by President/CEO Chris Scholin and Director of the SURF Center James Birch, set out to devise a fleet of three long-range autonomous underwater vehicles (LRAUVs) equipped with samplers for collecting microbes, along with sensors for recording corresponding environmental conditions under which they were found. The team worked in close collaboration with microbial ecologists at the University of Hawaii, with support from the National Science Foundation, starting in 2013. This project was dubbed MiVEGAS, standing for Multiple Vehicle EcoGenomic Automated Samplers. The “ecogenomic” portion of that acronym reflects the objective of using the system to link organisms’ presence and genetic expression to change in environmental variables such as light and nutrient availability. Satellite altimetry showing the eddy targeted with the 3G-ESP/LRAUV, just north of the island of Maui. The eddy is defined by deviation (in centimeters) from mean sea-level (sea level anomaly; SLA). Black line (leaving from south side of Oahu) shows planned ship waypoints through the eddy. 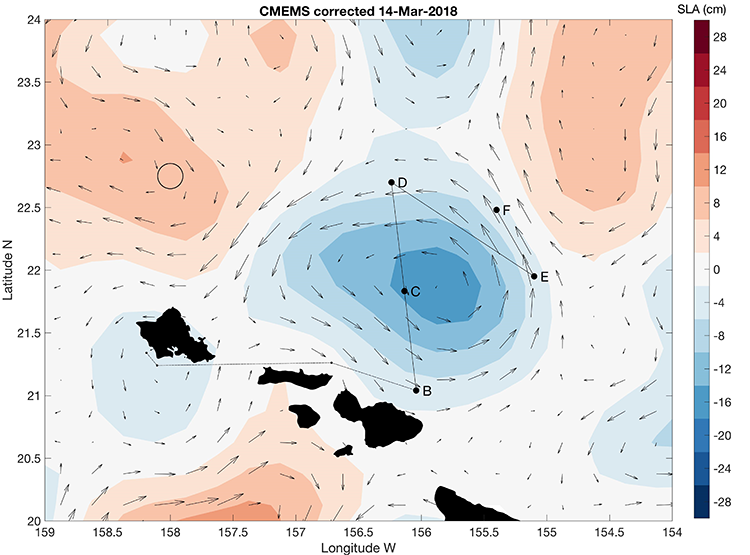 In Spring of 2018, the researchers boarded the R/V Falkor (operated by the Schmidt Ocean Institute) to test the MiVEGAS concept in waters north of the Hawaiian Islands, targeting eddies that are thought to play an important role in driving booms and busts of microbes. Eddies of diameters of 60 to 100 kilometers (35 to 60 miles) commonly sweep westward of the Hawaiian Islands, often persisting for several weeks. Depending on rotational direction, these features result in nutrients being driven upward into sunlit waters or pushed deeper where less light is available for photosynthesis which, in turn, affects activities of the resident microbial populations on a massive scale. Unraveling the complexities of all the chemical transactions in the vast expanse of the open sea is difficult; subtle alterations in ocean conditions have profound consequences for driving “booms and busts” of microbes that underpin the ocean ecosystem. 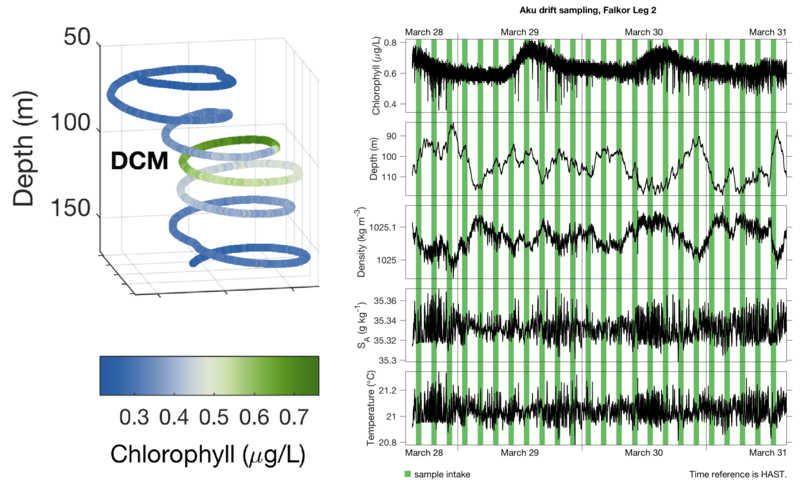 As a first test of MiVEGAS, researchers focused on an eddy that would induce nutrient upwelling, which in turn would fuel microbial production in a layer 80 to 120 meters deep known as the Deep Chlorophyll Maximum (DCM). This layer is known to be rich with life and is central to understanding carbon cycling in the open ocean. To observe this phenomenon, the vehicles were programmed to transect the eddy and then, once in the center, drift within the DCM and repeatedly collect samples autonomously without surfacing. At the same time, a Wave Glider —an autonomous surface craft—followed the pairs’ progress. Never before had the team attempted such an ambitious experiment in the open ocean. Separate data from two MiVEGAS AUVs (named Opah and Aku) operating in synchrony. Opah was instructed to fly a cork-screw pattern through the water column while making contextual measurements (left; only chlorophyll shown) while keeping Aku near the center of the spiral at the deep chlorophyll maximum (DCM). Meanwhile, Aku drifted in the DCM (black lines, right), instructed the ESP to sample every three hours (green vertical lines). One vehicle tracked and sampled the DCM layer, while a second vehicle circled it to provide contextual measurements surrounding those samples. When data from the two vehicles are combined, water column conditions are revealed as well as the path taken to track the chlorophyll-rich layer. Superimposing data from two vehicles. Color plots are interpolations (density, temperature, salinity, chlorophyll) from vehicle Opah flying circles around Aku over three days. The black line is identical in each plot, and shows Aku’s depth over the same three days. 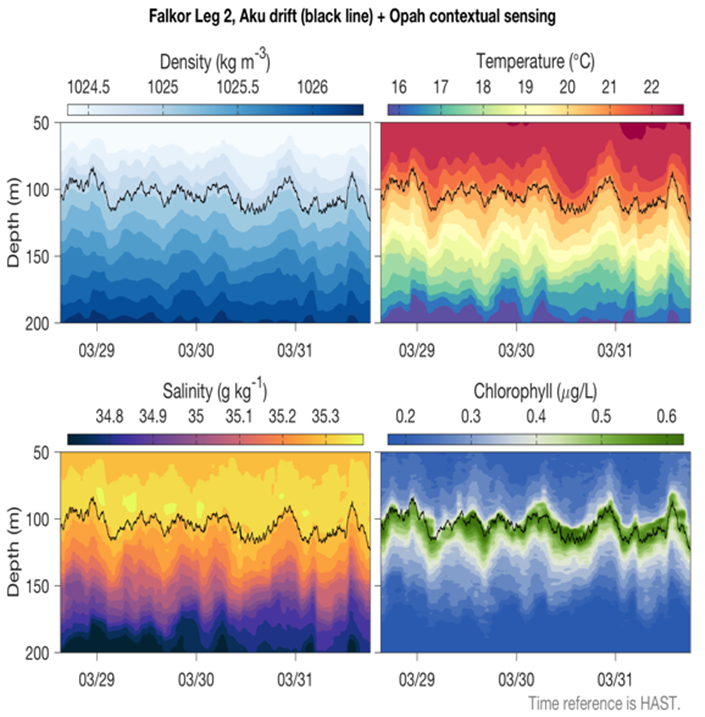 By instructing Aku to stay at the temperature at which the deep chlorophyll maximum (DCM) occurs, the drifting Aku shows remarkable fidelity to the actual DCM as measured by Opah (lower right panel). 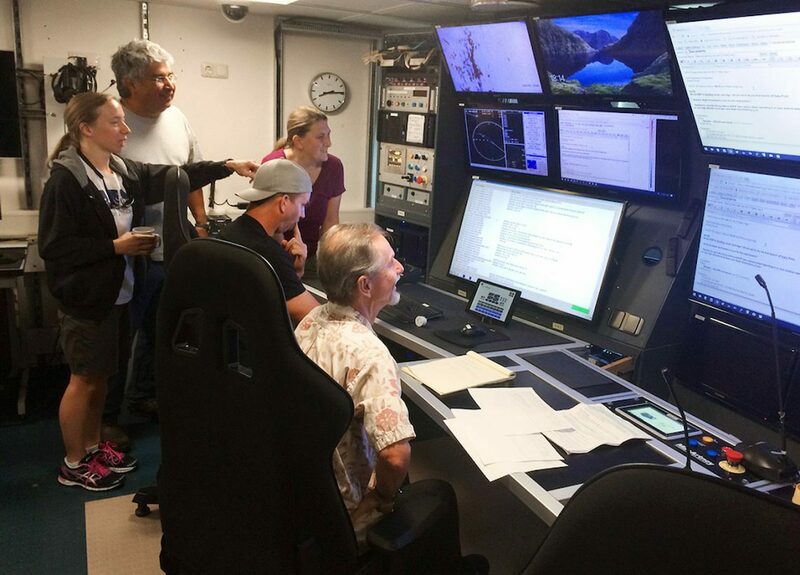 The technology developed for the MiVEGAS project in Hawaii is helping to foster new collaborations and technology-transfer connections. 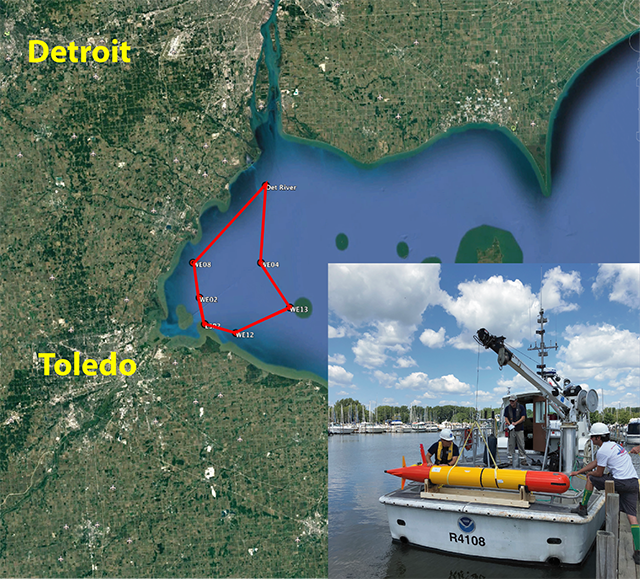 Two projects with the National Oceanic and Atmospheric Administration (NOAA) in Monterey Bay and Lake Erie take advantage of the mobility and high-frequency sampling capabilities demonstrated during the MiVEGAS project. This technology is now being tested as a tool for collecting environmental DNA (eDNA, which in this case refers to genetic material shed or excreted by animals) as a means to assess the diversity and relative abundance of species in aquatic environments without directly observing the animals themselves. These tests are being undertaken during field experiments conducted largely in conjunction with NOAA’s Marine Biodiversity Observation Network (MBON) initiative, also highlighted in this year’s report. In August 2018, the ESP team deployed an LRAUV equipped with a 3G ESP and detection module specifically tuned to register the toxin microcystin. The vehicle flew a clockwise loop starting near the mouth of the Detroit River, heading south to the Ohio shore, then turning west and north to complete the survey along Michigan’s shore. The mobility and sampling capability afforded by the ESP-LRAUV system has also sparked interest in using the vehicle to monitor harmful algal blooms in Lake Erie, where the drinking water supply for the city of Toledo, Ohio, is seasonally threatened by a deadly toxin produced by Microcystis, a cyanobacterium. A modified version of the MiVEGAS vehicle was designed to allow for both sample preservation as well as real-time toxin analysis. After five years of engineering development (sponsored by NSF and the Moore Foundation), MBARI’s ESP group fielded the first such mobile analytical system in August. For the first test of its kind it was very successful, proving that the concept of analyzing samples “on the fly” to search for microcystin remotely while preserving samples in parallel, all aboard a mobile platform, was possible. Based on that initial success, the team plans to return to Lake Erie next year to scout for potential toxin hotspots and to carry out the real-time toxin detection and sample preservation operations, in some ways similar to what was done off Hawaii last spring. While autonomous mobile systems are of keen interest to ocean scientists and resource managers overseeing large lakes, the US Geological Survey (USGS) has taken note of MBARI’s water- sample-collection technology in a very different context: acquiring samples from rivers as part of a monitoring strategy for tracking the spread of harmful and invasive species. In particular, there is a need to sample at specific sites repeatedly over long periods of time, as well as to have a hand-portable sampling and analytical system to quickly spot-check waterways of interest. Given the USGS’s broad charge to monitor and manage US inland waterways, new technologies that make that work more effective are particularly attractive. 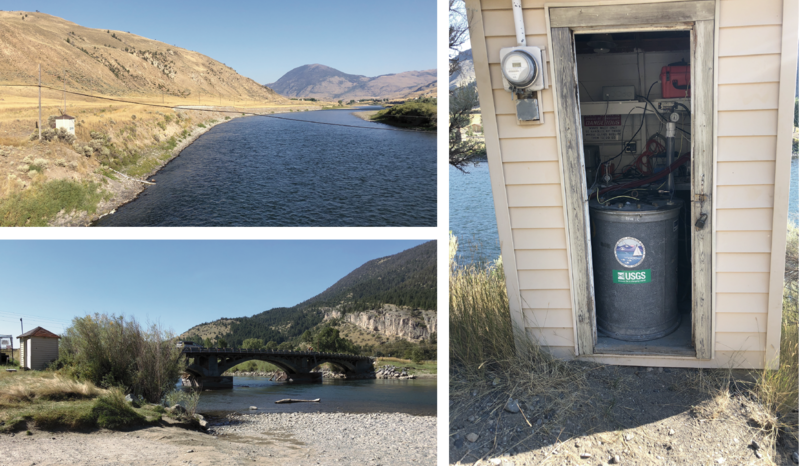 Two ESPs were deployed on the Yellowstone River in stream gage sheds built by the USGS—one at Corwin Springs (top), and a second approximately 65 kilometers (40 miles) downstream at Carter’s Bridge. Water was fed to the ESPs via an automated pumping system developed at MBARI. Photo by Jim Birch. 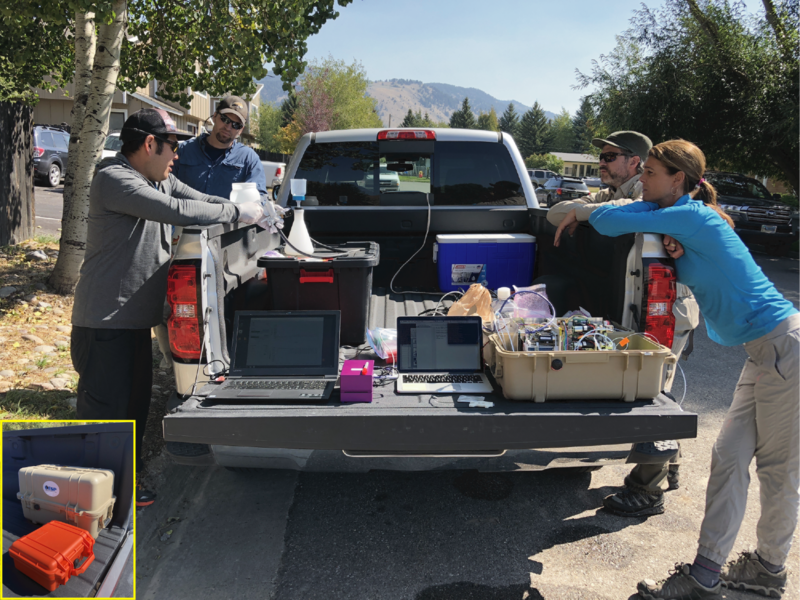 In 2018 MBARI’s ESP group used both fixed installations and portable versions of the ESP to explore these ideas further. Two ESPs, generally used in concert with ocean moorings, were installed in stream gages along the Yellowstone River to acquire a high-resolution time-series sequence of samples that USGS personnel will test for non-native species (small-mouth bass and New Zealand mud snail) and the organism that causes proliferative kidney disease in trout. Historically, USGS personnel collected one sample every six weeks; never before have they had the capability to autonomously collect two samples per day for up to 65 days. One version of the ESP was modified to yield a hand-portable version that was fitted inside a fishing tackle box, which led to calling the instrument the “tackle box ESP.” This device is used to collect and prepare a sample for immediate on-site testing, for instance by coupling it to a commercially available, battery-operated DNA analysis system. It was used to conduct a series of tests of waters that drain the National Elk Refuge in northwest Wyoming. These waters begin in the Elk Refuge, but traverse the densely populated area of Jackson Hole, and there is great interest in understanding whether pathogenic bacteria found in Jackson Hole streams are associated with elk excrement or with sewage effluents from human septic systems. Preliminary tests showed that this sampling system can be used to acquire water and automatically generate a sample on the spot that is “analysis ready.” The USGS and other private interests would like to expand the stream gage and real-time sample analysis efforts in the future. All instrumentation for the "tackle box ESP" is contained within two boxes (inset). Water was collected from streams draining the National Elk refuge in Wyoming and analyzed for *E. coli* contamination using the ESP to prepare the sample and a new type of portable qPCR module (center; purple cube) provided by a commercial company. This was a demonstration for USGS and employees of the Teton Conservation District. Photo by Jim Birch. Finally, in collaboration with the Monterey Bay Aquarium, a new study aims to determine if eDNA can be used to detect and quantify particular native and non-native species found in two Monterey-area coastal streams. The co-occurrence of native and invasive species poses many fundamental questions related to stream ecology, and presents challenges for resource managers and conservationists. Promising results of the study are being used to conceptualize a multi-year investigation to determine if eDNA measurement technology applied in these rivers could become a cornerstone of a new resource management strategy and be incorporated into a formal resource management framework. These different studies—spanning from Hawaii to the Midwest and points between—showcase how MBARI scientists are trying to solve the age-old problem of being in the right place at the right time. By tackling this complex problem with innovative new technology, the aim is to greatly improve the means by which people can sample the environment for meeting scientific research as well as resource management needs.